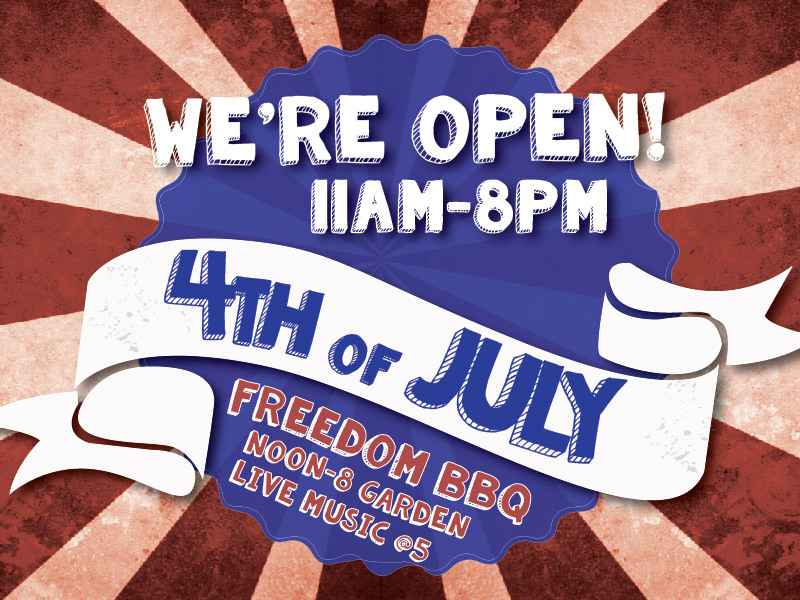 Freedom BBQ in the Beer Garden [FREE, All ages] Rather than our usual Fish Fry, we’re going to be doing some good ol’ fashion BBQ Grillin’ in the Beer Garden. After all, nothing says ‘Merica like cold craft beer and a BBQ. The grill will be hot Noon-8pm. FREE Live Music by Odd Ones Out and The Vonvettas (5:00-8:00). [*Note: Our Tap Room and Bistro will be open on the 4th, 11am-8pm] Happy Birthday USA. Cheers! Yes we CAN! Canned Craft Beer Festival Spend Independence Day with 20 of your local brewers, neighbors, friends, and your family at RE Sources’ Yes, We Can! Craft Beer Festival at Elizabeth Station. Games for the kids, beer for the parents, live music by Hot Damn Scandal, Moongrass and more. Kicks from the Bellingham Circus Guild, and a great view of the fireworks for all. If you want to avoid paying the processing fee, you can purchase your tickets online or in person right here at Boundary. Haggen Family 4th The Chamber of Commerce and Haggen throw their annual 4th of July Party and fireworks display at Zuanich Point Park (11am-11pm). The’ve got the whole day loaded with events; check it out. Boundary will be providing Beer for the festivities. Fireworks at 10:30pm! Party on the Herald Head to the Herald building and watch the fireworks from the best seat in Bellingham! Purchase of a ticket gets you to the roof, and includes food, beer, and live music. All proceeds of this event go to support the Downtown Bellingham Partnership, an organization uniting the diverse interests of downtown Bellingham. Email Subscription to Boundary's Blog! Boundary Bay Brewery opened in 1995 and we've been Saving The Ales ever since! We pride ourselves on making great handcrafted beer and fresh, local food for the Bellingham community. Our brewery, which houses a Tap Room and a family friendly Bistro, is located in a historic 1922 warehouse in Downtown Bellingham, across from the Saturday Farmer’s Market. We also have a great deck for outdoor dining and a Beer Garden where you can enjoy BBQ's and outdoor concerts in the Summer. You can see why this is where the locals love to go! We work hard to brew great craft beer and we've been recognized with over 70 awards for our handcrafted beers over the years. Come see what makes us so special!